The machines made for air popped popcorn have come a long way over the years. In the past, air poppers were often ineffective and not very economical. Oftentimes, there would be many kernels wasted because they did not pop. It took as long as ten minutes to air pop four cups of popcorn. It's not that difficult to understand how air poppers make air popped popcorn. The popper is plugged into the electrical outlet which turns on the machine's heating element. This will also start a fan which blows air through the heating element, heating the air significantly. The hot air then blows up through the kernels heating them and also moving them around inside of the machine. As the kernels heat up steam is created inside each of them increasing the pressure and eventually causing the kernels to explode. Measure out the amount of popcorn kernels you plan to make - Most air poppers recommend 1/2 cup of kernels which will make about 4 quarts of popped popcorn. Be sure to follow the manufacture's instructions on the maximum the popper can handle. Put the kernels aside for the moment. Plug the popper into a wall outlet -This will turn on the fan and heating element in the popper. Let the air popper heat up - Wait about 1 minute for the popper to heat up. During this time be sure the plastic chute which guides the popcorn from the popper is not in place on the popper. If left on the popper it can get extremely hot and burn you if touched. This warmup period assures the hot air has been heated to a temperature suitable for efficient popping. Dump the kernels you measured earlier into the popping chamber of the popper - Then replace the plastic chute on the popper. During this time before the popcorn begins to pop, sometimes unpopped kernels will get "blown" out of the popper. This typically depends on the brand of air popper and the size and weight of the popcorn kernels you are using. I have found that this problem can be largely mitigated by tilting the popper back so the exit of the chute is pointing slightly upward. Once the popcorn starts to pop you can set it back down. Place a bowl under the chute to catch the popcorn as it exits the chute - Be sure the bowl you have is large enough to hold all the popcorn that will be produced. Since there is hot air being blown into the bowl from the popper chute a metal bowl can get very hot to the touch. So a plastic bowl usually works best. Unplug the popper cord from the wall outlet - Do this once all of the popped popcorn has been blown from the popper into the bowl. You are now ready to eat some popcorn. Since air popped popcorn is very bland, most folks will add some type of seasoning before jumping in. In other methods of popping popcorn the popped flakes remain in the heat and humidity of the popcorn popper until the popping completes. In contrast, with a air popcorn popper, the popped flakes quickly exit the popping chamber and make their way to the bowl. As a result the popcorn from an air popcorn popper is more fluffy and dry than in the other methods. The top of most air popcorn poppers hold a cup that can also be used to measure how many popcorn kernels to use in the popper. It's nice that it's always there and you don't have to search for a measuring cup in your kitchen. It is very important, however, that you remember to replace the measuring cup in the lid before you turn on the popper. Many air poppers have a small cup on top for melting butter. It's not clear that this is really a "feature". Butter gets very hot once it is melted. Unfortunately, many of these poppers have plastic cups for the butter and they crack from the heat after using it for a few months. We recommend that you melt butter in the microwave so the cup will not break. An air popcorn popper is very efficient when it comes to making popcorn. Normally there are very few "old maids" (unpopped kernels) left in the popping chamber. 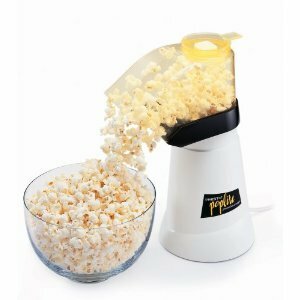 Since no oil is involved, the setup and cleanup of the air popcorn popper is very simple. The popping chamber just needs to be dumped out if there are unpopped kernels in there. The cover and butter melter can be cleaned with warm soapy water. If the butter melter is not used, just wiping the unit down with a dry cloth is all that's required. The air popped method is one of the healthiest ways to make popcorn. There is no added oil or salt, unless you do so after the corn has been popped. For a full cup of air popped popcorn, there are only thirty calories. That's a ridiculously low number of calories for a tasty, filling treat.